Situated at the axis between North and South America and wracked by poverty and conflict, Guatemala is both an important source of migrants and asylum seekers as well as a crucial transit country. Some 1.5 million Guatemalans live in the United States and approximately 300,000 people transit the country every year. In addition, Guatemala hosts roughly 76,000 foreign nationals, most of whom come from neighbouring Central American countries. The country has also hosted significant numbers of so-called extraregional migrants from Colombia, China, India, and Ecuador, among other countries. The majority of foreigners living in Guatemala are undocumented. Because of its key role in the regional migration phenomenon, Guatemala has long been pressured by other countries in the region, mainly Mexico and the United States, to halt the movement of foreigners across its borders. Reports indicate that since as far back as the late 1990s, U.S. immigration authorities have helped support, sometimes with financial assistance, the apprehension and detention of third-country nationals in Guatemala. The country’s detention facilities, which it euphemistically terms “shelters” (or centros de albergue), have included dilapidated former hotels as well as naval bases. The 1998 Migration Law (Ley de Migración, Decree 95-98) and the 1999 Migration Regulation (Reglamento de Migración) provide the legal framework for migration management in Guatemala, including grounds for immigration-related detention, which is euphemistically referred to as albergar (to shelter or accommodate). The 2001 Refugee Regulation (Reglamento para la protección y determinación del Estatuto de Refugiado en el Territorio del Estado de Guatemala) establishes refugee protection and status determination procedures. Observers have criticized these laws for failing to provide procedural guarantees or adequate guidance on the application of discretion when treating undocumented migrants and asylum seekers. These legal lacunae, they argue, lead to arbitrary decision-making and enable corruption and abuse. The General Directorate for Migration (Dirección General de Migración), an agency of the Interior Ministry (Ministerio de Gobernación), is empowered—along with the police—to apprehend non-citizens and has custodial authority over immigration detainees. The directorate has repeatedly been the target of corruption allegations. Grounds for detention. Non-citizens who enter or stay in the country without authorization may be subject to a fine, deportation, or expulsion. Article 111 of the Migration Law provides that the Directorate General for Migration may “accommodate” (albergar) non-citizens who do not have required travel documents in designated centres (centros destinados especialmente para este fin), which are misleadingly called “accommodation centres” or “shelters” (centros de albergue). Other countries in the region use similar euphemisms, including Mexico (estacion migratoria), Honduras (centro especiale de atencion), Nicaragua (centro de albergue de migrantes), and El Salvador (centro de atención integral para el migrante). According to some reports, immigration authorities systematically apply detention measures. However, given the small numbers of officially reported detainees (see below) it seems unlikely that all detected or apprehended undocumented travellers are placed in immigration detention. Official statistics. According to statistics from the Directorate General for Migration, in 2015 563 non-citizens were detained at Guatemala’s sole detention centre, 526 in 2014, 341 in 2013, and 308 in 2012. It is unclear if these numbers represent all immigration-related detentions as they refer uniquely to the “albergue” in Guatemala City. They also appear to diverge from reports made by non-governmental organizations, which have reported much higher numbers of detainees dating back to the mid-2000s. For instance, during the period January-October 2005, 3,020 migrants were reportedly apprehended and placed in detention; during the same period in 2006, 1,478. While the official number of migrants detained annually has been rising during the past few years, these figures are comparatively low considering the migratory and political pressures faced by Guatemala. Neighbouring Honduras, which is also an important source and transit country for migrants, detained 2,526 migrants in 2013 and 1,198 in 2012. According to official sources, between 2012-2015 the largest number of detainees were from El Salvador (420), followed by Honduras (348), Nicaragua (332), Ecuador (160), and Cuba (103). In addition, during this four-year period, the detention centre in Guatemala City confined 79 migrants from Nepal, 86 from China, 40 from India, and 33 from Bangladesh. The total number of detainees comprised 206 women in 2015, 296 women in 2014, 181 women in 2013, and 210 women in 2012. In 2009 the UN Special Rapporteur on the Human Rights of Migrants noted that the majority of detainees were between 18 and 29 years old. Length of detention. The Migration Law does not set a limit to the length of detention. Those most impacted by this legal gap have been migrants and asylum seekers from outside the region—including people from India, China, Nepal, and Uzbekistan—whose home countries do not have consular representation in Guatemala. People from South American countries like Ecuador, Peru, Bolivia, and Venezuela have also faced lengthy periods in immigration detention because their consular representatives refuse to assist in covering deportation costs. Thus, while people from Central America are reportedly detained for at most a few days, migrants from other continents can be kept in the detention for up to 10 months. Procedural guarantees. Deportation procedures are to be subject to a hearing (Migration Law, article 113). However, because the law does not explicitly mention the word “detention” the legislation lacks any provisions for reviewing detention measures. There is no right to appeal, legal or linguistic assistance, or alternatives to detention. There are similar gaps in Honduras because the immigration legislation also fails to explicitly regulate it. Article 116 of the Migration Law vaguely mentions that appeals of migration-related decisions are regulated by the Law on Administrative Litigation. Yet, it is not clear whether detention is covered by this provision and sources in Guatemala told the Global Detention Project that it was unclear the extent to which efforts have been made to apply this law in court. 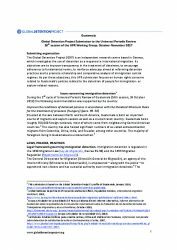 In 2014 the International Detention Coalition reported that there was no judicial control over immigration detention and that authorities were not willing to allow civil society organizations to provide legal assistance to detainees. Detainees are reportedly informed about the reasons they are in custody. Yet, this information is not necessarily conveyed in a language they understand. Guatemala’s main detention centre does not employ a translator so detainees do not have access to linguistic assistance. Detainees can request privately paid legal advice. Apprehensions. Apprehension operations are carried out jointly by the Directorate General for Migration and the police. These operations are justified as combatting petty criminality. In 2005, the directorate reported that there were 137 apprehension operations; it reported 180 in 2006. Operations are often carried out in bars or nightclubs in the capital, Guatemala City. In 2006, these operations resulted in the apprehension of 1,759 non-citizens, of whom 98 percent were women. The most frequent countries origin of apprehended migrants were Nicaragua (498), El Salvador (392), Ecuador (346), Honduras (315), and Peru (102). According to civil society sources in Guatemala, breaches of fundamental rights are common during apprehension operations. People who appear to be victims of trafficking are often not treated with proper care, officials neglect to document if minors are taken into custody, and there is a lack of female staff to carry out body searches when women are apprehended. Cooperation with the United States. Guatemalan security services, including military and immigration officers, have collaborated for decades with U.S. officials to prevent and interdict irregular migration on land and sea. Journalistic accounts also have detailed collaborative migration control initiatives, which are often framed as “anti-smuggling” operations. One report from 2002 cites a press release from the former U.S. Immigration and Naturalization Service (INS) that reported that a multi-lateral anti-smuggling operation, which took place in 2001 and involved several Latin American countries, had been “the largest, most successful operation of its kind.” The operation, called “Crossroads International,” reportedly resulted in the arrest of some 8,000 migrants and 75 smugglers in 12 Latin American countries. The INS claimed that law enforcement agents from Colombia, Costa Rica, the Dominican Republic, Ecuador, El Salvador, Guatemala, Haiti, Honduras, Jamaica, Mexico, Panama, and Peru participated in the operation. The PDH official also questioned the legality of some of the detentions. He pointed to a case in March 2001 when the U.S. Coast Guard, working with the U.S. Navy, intercepted an Ecuadorian fishing vessel in international waters off the coast of Costa Rica that was carrying some 220 undocumented migrants from Ecuador. According to a PDH report about the case, after the boat was escorted to Guatemala’s Puerto Quetzal, the U.S. embassy asked that nation’s vice president to have the five crew members detained. Guatemala’s migration authority subsequently brought charges against the crew members, accusing them of illegally bringing people into the country—although the boat had been detained in international waters. A judge threw out the case, but the DGM refused to release the crew. They remained in detention for several months before reportedly escaping. Asylum seekers. Asylum seekers are generally not detained. If a non-citizen applies for asylum after being taken into custody, the person is supposed to be released. Once released, asylum seekers have to renew their permits every ten days. Vulnerable persons. Accompanied children are detained with their families while unaccompanied minors have generally been accommodated in alternative facilities. According to the official statistics, between 2012-2015 there were four children detained alongside their parents. Until early 2009 undocumented children tended to be accommodated at Casa Allianza Guatemala during identification proceedings. Since the closure of the shelter due to lack of funds there apparently have been no places that can offer specialized care for unaccompanied children in irregular situation. These children appear to be accommodated in shelters for minors managed by the state or NGOs. Sources told the Global Detention Project that there are three shelters for unaccompanied girls in Guatemala City, one managed by the Social Welfare Secretariat called Hogar Securo and the other two by the Asociación La Alianza y Asociación El Refugio de la Niñez. Until December 2015, women victims of trafficking were accommodated in Albergue Luz de Esperanza, managed by the Social Welfare Secretariat. Since its closure, no other facility has been opened, raising the possibility that trafficking victims could end up being placed in detention centres. Criminalization. The Migration Law does not criminalize irregular stay or entry per se. What is punished with imprisonment are acts related to facilitation of entry and transit of undocumented migrants thought the country (Migration Law, article 103-108). Designated sites of detention and authorities. Article 111 of the Migration Law provides that the Directorate General for Migration may establish or authorize facilities for use as detention centres (or centros de albergue). The provision specifies that the centres are to comply with minimum conditions. Police are to provide security at the centres (Migration Regulation, article 96). The Migration Law (article 111) also stipulates that the Directorate General for Migration may enlist the services of non-profit organisations to provide assistance for migrants in transit. Under article 96 of the Migration Regulation, any organization authorized by the Directorate General for Migration to manage an albergue has to comply with the following obligations: a) give written notice per fax to the Directorate General for Migration’s Department of Immigration Control (Subdirección de Control Migratorio) of all foreigners who enter the centre; b) provide access to the directorate so it can establish the immigration status of detainees; c) and allow the police to provide security. Access to detainees. The Human Rights Ombudsman (Procuraduría de los Derechos Humanos) appears to be the only institution allowed to enter the detention centre in Guatemala City. However its access is reportedly limited. In addition there are number of human rights organizations, including Mesa Nacional para las Migraciones en Guatemala (MENAMIG), that seek to assist migrants and detainees. Guatemala currently operates one albergue as a detention centre. The facility, which is located in “zona 5” of Guatemala City and has been in use since 2007, reportedly has a capacity of 100 and can accommodate both men and women. The locations and modalities of detention centres have changed several times over the years and the government has at times received U.S. financial assistance to operate detention centres. The United States reportedly responded favorably to this request. A U.S. embassy press attaché said in an interview at the time: "The decision to support this request was made on the basis of the needs of the migrants. They need to be housed and cared for, and the question was what can we do to make sure there is a place for them to stay as their nationality is being established. That was the concern; that was what we tried to accomplish." The U.S. funded detention efforts received enormous critical attention in Guatemala, although only one newspaper in the United States picked up the story, the Miami Herald. The Herald carried a small article in its inside pages reporting on the death of a migrant from India at a U.S:-funded facility who committed suicide after spending months in detention and having little prospect to get to his hoped for destination, the United States. Margarita Hurtado, a member of a Guatemalan migrants rights group, described for a journalist the conditions at the two U.S.-funded detention centers, which were eventually closed down: "After they initiated [the anti-smuggling operation] ‘Coyote 2001,’ the centres were filled with people from everywhere—from Ecuador, India, Peru, Syria, Cuba. In one space there were 40 people … there was no light, no air. They were worse than our jails." Among the facilities that were used by the Directorate General for Migration at the time were several dilapidated former hotels located in “zona 1” of Guatemala City, including Hotel Brasilia, Hotel Capri and Hotel Espana. These places did not offer basic material conditions to detainees. The argument of the authorities to stop these detention arrangements was that they did not allow adequate security and surveillance measures. The Directorate General for Migration then established a new detention centre (called albergue) in a different part (“zona 9”) of Guatemala City. This detention centre also attracted criticism because of its inadequate conditions. Albergue in “zona 5.” The current detention centre, located in “zona 5” of Guatemala City, confines women and men on the second and third floors, respectively. Both floors have a similar set-up and are divided in two sections. Each floor has a common area that is equipped with tables and chairs, TV and air-conditioning. The sleeping areas have 25 bunk beds. A roof terrace is used as a recreation space, which immigration detainees can occasionally access, men and women separately. There is a laundry building located on the terrace, which is used for detaining families. Immigration detainees have access to medical assistance once a week. The building is secured by metal bars on the windows, electrical wires, and armed police officers. Conditions at the centre have been repeatedly criticized. In 2008 the Defensoría de Población Desarraigada y Migrante of the Human Rights Ombudsman (Procuraduría de los Derechos Humanos) visited the centre and found serious shortcomings, including inadequate ventilation, lack of means of communication (telephones), insufficient recreation space, and inadequate rooms to meet consular representatives. In 2011, the UN Committee on Migrant Workers expressed concern over reports about prolonged detention of non-citizens from outside the region in the centre, the failure to appoint interpreters, inadequate conditions, in particular the lack of open spaces and ventilation for migrants, as well as limited access to basic social services. In addition, the committee was concerned about the lack of information on the number of immigration detainees, given the considerable number of migrants who transit through Guatemala every year. The committee urged Guatemala to improve conditions at the facility, ensuring the provision of basic social services, including food, health care and hygienic conditions. It also encouraged the state to expedite exit procedures and to ensure that men and women are duly separated. United Nationas Deportment o Economic and Social Affairs, Population Division, International Migration Wallchart, 2015, http://www.un.org/en/development/desa/population/migration/publications/wallchart/index.shtml. See, for instance, Michael Flynn, “Dónde Esta La Frontera?” Bulletin of the Atomic Scientots, Juyl/Augusts 2002, http://www.globaldetentionproject.org/sites/default/files/fileadmin/publications/Flynn_frontera.pdf. Instituto de Estudios Políticos para América Latina y África and Médicos Sin Fronteras, Informacion comparada sobre detencion de solicitantes de asilo en Centroamerica y Caribe, 2007, http://www.gloobal.net/iepala/gloobal/fichas/ficha.php?entidad=Textos&id=4303&opcion=documento#ficha_gloobal. Isabel Rosales, "Public Officials and the Migration Industry in Guatemala: Greasing the Wheels of a Corrupt Machine," in Thomas Gammeltoft-Hansen and Ninna Nyberg Sørensen (eds. ), The Migration Industry and the Commercialization of International Migration, Routledge, 2013, 215-237. Direccion General de Migracion, Reporte estadistica anual de personas extranjeras albergadas por la Direccion General de Migracion ano 2012-2015. Relator Especial sobre los derechos humanos de los migrantes, Informe del Relator Especial sobre los derechos humanos de los migrantes, Sr. Jorge Bustamante, Adición: MISIÓN A GUATEMALA, A/HRC/11/7/Add.3, March 2009, http://www.ohchr.org.gt/cd_instrumentos/documentos/Migra.pdf. http://tbinternet.ohchr.org/_layouts/treatybodyexternal/Download.aspx?symbolno=INT%2fCMW%2fNGO%2fGTM%2f15%2f8967&Lang=en; and Instituto de Estudios Políticos para América Latina y África and Médicos Sin Fronteras, Informacion comparada sobre detencion de solicitantes de asilo en Centroamerica y Caribe, 2007, http://www.gloobal.net/iepala/gloobal/fichas/ficha.php?entidad=Textos&id=4303&opcion=documento#ficha_gloobal. 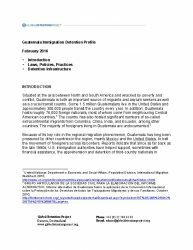 International Detention Coalition (IDC), INFORME REGIONAL DETENCIÓN MIGRATORIA Y ALTERNATIVAS A LA DETENCIÓN EN LAS AMÉRICAS, October 2014. Undisclosed source, Global Detention Project Questionnaire : Guatemala, November 2015. GRUPO ARTICULADOR DE LA SOCIEDAD CIVIL PARA LA ELABORACIÓN DEL INFORME ALTERNATIVO, Informe alternativo de Guatemala Sobre la aplicación de la Convención Internacional sobre la Protección de los Derechos de todos los Trabajadores Migratorios y de sus Familiares, October 2010. Michael Flynn, " U.S. Anti-Migration Efforts Move South,” Americas Program, 3 July 2002, http://www.cipamericas.org/archives/1066. Carol L. Girón Solórzano, “Estudio Migratorio de Guatemala,” in Instituto Centroamericano de Estudios Sociales y Desarrollo (INCEDES) and Sin Fronteras (Eds. ), Estudio comparativo de la legislación y políticas migratorias en Centroamérica, México y República Dominicana, November 2011, http://www.sinfronteras.org.mx/index.php/es/publicaciones/de-sin-fronteras/informes-anuales-2/14-informes-tematicos/380-estudio-comparativo-de-la-legislacion-y-politicas-migratorias-en-centroamerica-mexico-y-republica-dominicana. Undisclosed source, email correspondance with Michael Flynn (Global Detention Project), February 2016. Relator Especial sobre los derechos humanos de los migrantes, Informe del Relator Especial sobre los derechos humanos de los migrantes, Sr. Jorge Bustamante, Adición: MISIÓN A GUATEMALA, A/HRC/11/7/Add.3, March 2009, http://www.ohchr.org.gt/cd_instrumentos/documentos/Migra.pdf and Undisclosed source, email correspondance with Michael Flynn (Global Detention Project), February 2016. Cited in Michael Flynn, “Dónde Esta La Frontera?” Bulletin of the Atomic Scientots, Juyl/Augusts 2002, http://www.globaldetentionproject.org/sites/default/files/fileadmin/publications/Flynn_frontera.pdf. Procurador de los Derechos Humanos, Defensoría Población Desarraigada y Migrante, Informe Monitoreo Albergue, 2008. Committee on the Protection of the Rights of All Migrant Workers and Members of Their Families, Concluding observations of the Committee on the Protection of the Rights of All Migrant Workers and Members of Their Families: Guatemala, CMW/C/GTM/CO/1, 18 October 2011, http://tbinternet.ohchr.org/_layouts/treatybodyexternal/Download.aspx?symbolno=CMW%2fC%2fGTM%2fCO%2f1&Lang=en. National Constituent Assembly, Constitution of the Republic of Guatemala, 1985, http://guatemala.justia.com/nacionales/constitucion-de-la-republica-de-guatemala/. Migration Law (Ley de Migración), Decree 95-98, 1998, http://www.migracion.gob.gt/images/documentos/leydemigracion.pdf. Migration Regulation (Reglamento de Migración), 1999, http://www.migracion.gob.gt/images/documentos/leydemigracion.pdf. Migration Law (Ley de Migración), article 109-111. GRUPO ARTICULADOR DE LA SOCIEDAD CIVIL PARA LA ELABORACIÓN DEL INFORME ALTERNATIVO, Informe alternativo de Guatemala Sobre la aplicación de la Convención Internacional sobre la Protección de los Derechos de todos los Trabajadores Migratorios y de sus Familiares, October 2010, http://tbinternet.ohchr.org/_layouts/treatybodyexternal/Download.aspx?symbolno=INT%2fCMW%2fNGO%2fGTM%2f15%2f8967&Lang=en. Carol L. Girón Solórzano, “Estudio Migratorio de Guatemala,” in Instituto Centroamericano de Estudios Sociales y Desarrollo (INCEDES) and Sin Fronteras (Eds. ), Estudio comparativo de la legislación y políticas migratorias en Centroamérica, México y República Dominicana, November 2011, http://www.sinfronteras.org.mx/index.php/es/publicaciones/de-sin-fronteras/informes-anuales-2/14-informes-tematicos/380-estudio-comparativo-de-la-legislacion-y-politicas-migratorias-en-centroamericamexico-y-republica-dominicana. Committee on the Protection of the Rights of All Migrant Workers and Members of Their Families. 'Consideration of reports submitted by States parties under article 74 of the Convention: Concluding observations of the Committee on the Protection of the Rights of All Migrant Workers and Members of Their Families: Guatemala'. CMW/C/GTM/CO/1. 18 October 2011. Report of the Working Group on the Universal Periodic Review: Guatemala. 31 December 2012. A/HRC/22/8. Migration Law (Ley de Migración), article 111.